The photo of this approximately 1.5" Arizona scorpion, Paruroctonus baergi, was taken in south western, Arizona in a sandy area. 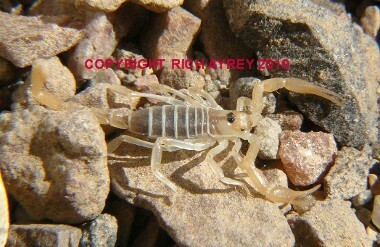 I am lucky to have this Arizona Scorpion pic available. This Flagstaff site copyright Rich Ayrey 2008-2017. Arizona Scorpion page created 04/03/08.